President Donald Trump issued an order this weekend that extends federal aid to help Iowans recover from severe storms and flooding. Federal assistance is available to individuals in five western Iowa counties. Residents of Fremont, Harrison, Mills, Monona, and Woodbury can apply for federal grants to cover temporary housing and home repairs. Low-interest federal loans are now available in those five counties to cover uninsured losses on personal and business property. Federal aid is also available to the State of Iowa as well as tribal and local governments in 56 counties to cover emergency work. “Public infrastructure damage has totaled approximately $77 million. 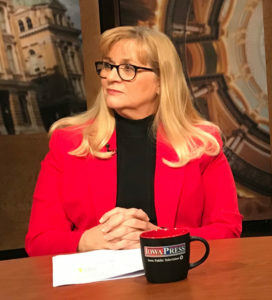 Those are initial estimates,” Joyce Flinn, director of Iowa Homeland Security and Emergency Management, said during a weekend appearance on Iowa Public Television. On Friday, Governor Reynolds submitted a total damage estimate of nearly $1.6 billion for losses associated with the flooding. That included an initial estimate of farm-related flood losses. That estimate indicates it would cost $525 billion fix the levees damaged in southwest Iowa. The president’s disaster declaration does not immediately trigger federal funding for levee repairs. See below for information from the governor’s office, the White House and USDA about a telephone hotline and websites to help individual flood victims learn what grants and loans are currently available. Sunday, March 24, 2019: DES MOINES – Today the governor’s office released the below information to help Iowans impacted by the recent flood. Applying for assistance to recover from the recent flooding in Iowa is easy and can be done via phone or online. Call 1-800-621-3362. You can call between 7 a.m. and 10 p.m., seven days a week. People who are deaf, hard of hearing, or have a speech disability and use a TTY, can call 800-462-7585. Go online to disasterassistance.gov. You can apply online 24 hours a day, seven days a week. When you apply by phone or online, you’ll be walked through the kinds of assistance that are available and what you need to do to apply. You’ll also be assigned a case manager to help you navigate the process. As of today, residents in Fremont, Harrison, Mills, Monona, and Woodbury counties have been included in a Presidential Disaster Declaration, making their citizens eligible to apply for this assistance. However, if you’ve been impacted by the recent flooding and you don’t live in one of those counties, register anyway. By doing this, you could help the citizens in your county become eligible for assistance. Who can apply? Anyone impacted by the flooding that started in Iowa on March 13. For information on Iowa’s flood recovery, visit www.floods2019.iowa.gov or call 211. March 23, 2019: WASHINGTON, DC. Today, President Donald J. Trump declared that a major disaster exists in the State of Iowa and ordered Federal aid to supplement State and local recovery efforts in the areas affected by severe storms and flooding beginning on March 12, 2019, and continuing. The President’s action makes Federal funding available to affected individuals in the counties of Fremont, Harrison, Mills, Monona, and Woodbury. Federal funding is available to the State and to tribal and eligible local governments and certain private nonprofit organizations on a cost-sharing basis for emergency work in the counties of Adair, Allamakee, Audubon, Boone, Bremer, Buena Vista, Butler, Calhoun, Carroll, Cass, Cherokee, Clay, Crawford, Dallas, Decatur, Dickinson, Emmet, Fayette, Franklin, Fremont, Greene, Guthrie, Hamilton, Hancock, Hardin, Harrison, Howard, Humboldt, Ida, Iowa, Jasper, Kossuth, Lyon, Madison, Mahaska, Marshall, Mills, Monona, Montgomery, O’Brien, Osceola, Page, Plymouth, Pocahontas, Polk, Pottawattamie, Sac, Shelby, Sioux, Tama, Union, Webster, Winnebago, Winneshiek, Woodbury, and Wright. Pete Gaynor, Acting Administrator, Federal Emergency Management Agency (FEMA), Department of Homeland Security, named Timothy J. Scranton as the Federal Coordinating Officer for Federal recovery operations in the affected areas. Residents and business owners who sustained losses in the designated counties can begin applying for assistance today by registering online at http://www.DisasterAssistance.gov or by calling 1-800-621-FEMA(3362) or 1-800-462-7585 (TTY) for the hearing and speech impaired. The toll-free telephone numbers will operate from 7 a.m. to 10 p.m. (local time) seven days a week until further notice. DES MOINES, Iowa, March 21, 2019 – Extreme weather conditions like the recent “bomb cyclone” impacted farmers and ranchers in Iowa. The U.S. Department of Agriculture (USDA) has disaster assistance programs available to help agricultural producers recover after natural disasters, including floods. Compensation also is available to producers who purchased coverage through FSA’s Noninsured Crop Disaster Assistance Program, which protects non-insurable crops against natural disasters that result in lower yields, crop losses or prevented planting. Eligible producers must have purchased NAP coverage for 2019 crops. In addition to helping producers, USDA also offers local governments and other entities with rebuilding infrastructure and removing debris. The NRCS Emergency Watershed Protection (EWP) program provides assistance to local government sponsors with the cost of addressing watershed impairments or hazards like debris removal and streambank stabilization. Interested entities should contact their local NRCS conservationist.